Southern Rockies Nature Blog: Beat the Heat — at the Fish Hatchery! Beat the Heat — at the Fish Hatchery! SALIDA, Colo. – Looking for a unique, free outing where your family can have fun such as making the water churn with ravenous, leaping trout in spectacular mountain settings? How about an outing where you may even learn a thing or two? Start by visiting the Chalk Cliffs Rearing Unit hatchery, where CPW raises catchable-size rainbow trout. The hatchery is at 22605 CR 287 near Nathrop, about two miles west of U.S. Highway 285 toward Mount Princeton. CPW volunteer “camp hosts” greet visitors from 9 a.m. to 4 p.m., daily from Memorial Day through Labor Day. See where CPW raises about 700,000 10-inch rainbows annually in concrete raceways and ponds for stocking in lakes along the Front Range. Free activities include fish feeding – watch the water bubble with frenzied rainbow trout that jump into the air when you toss a handful of feed into the ponds – and videos. For tour information, call Chalk Cliffs at 719-395-2378. Down the highway, Mount Shavano Hatchery sits along the Arkansas River west of Salida at 7725 CR 154. Camp hosts are on hand 10 a.m.-4 p.m., daily, to provide information on the hatchery and Colorado fish. Guests park at the top of the hill at Mount Shavano and walk down a set of steps to the hatchery. 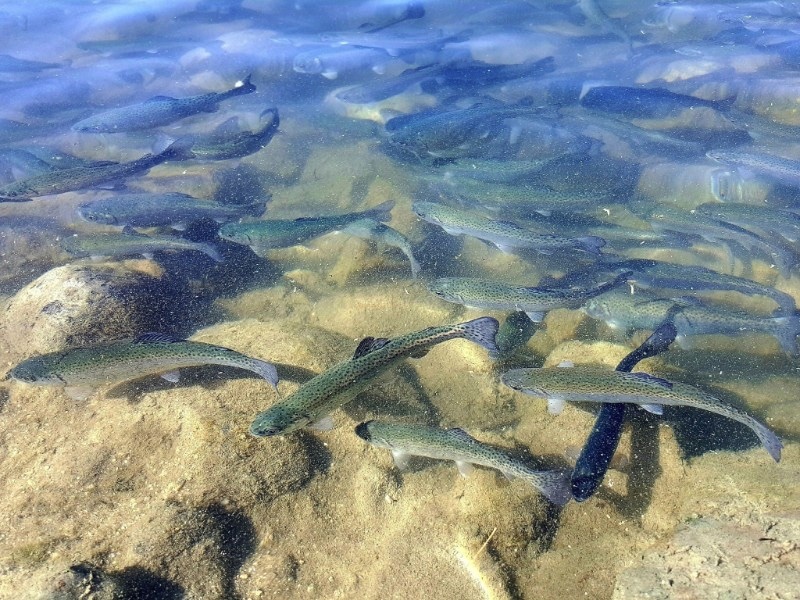 Mount Shavano Hatchery is one of the largest trout hatcheries in the state, annually producing 540,000 disease-free catchable 10-inch trout and 2-3 million smaller trout and kokanee salmon. Guests are greeted by interpretive signs explaining the life cycle of trout. Go inside, meet the CPW volunteer camp hosts, get a tour and watch great videos, including dramatic footage of CPW staff using airplanes to stock high mountain lakes. Then it’s out to the raceways to feed the fish. For more information, call 719-539-6877. For more information on these or any of Colorado’s 19 hatcheries, visit the CPW website www.cpw.state.co.us/Hatcheries.